Thanks to movies like Rambo and The Princess Bride, Nick Rossi became fascinated by knives at a young age. He began working at a retail cutlery store at the age of 15, where he was introduced to craftsmen that made handmade knives as well as customers who’s livelihood depends on knives. Nick is a full time Bladesmithing instructor and Program Coordinator at the New England School of Metalwork in Auburn, where people travel from all over the world to learn the craft of forging knives of all kinds. He is a rated Journeyman Smith in the American Bladesmith Society and member of the New England Bladesmith’s Guild. Nick’s favorite thing to make is kitchen knives, because Nick’s second favorite thing to make is food. 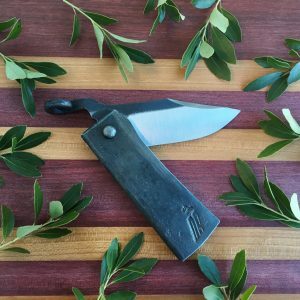 Shop Nick Rossi Knives in MCA Etsy Store.